You’ve probably received a lot of tips on things you can do to ensure your senior loved one stays healthy both physically and emotionally, but you may not have heard this one before. Orlando part-time care providers will explain why you should help your loved one live a life full of laughter to enhance senior health and wellness. New studies show that laughter can relax muscle tension and reduce aches and pains for as long as 45 minutes after an individual has a good laugh. Seniors who laugh regularly are more likely to feel like their younger selves again because laughter relieves muscle tension and body aches. 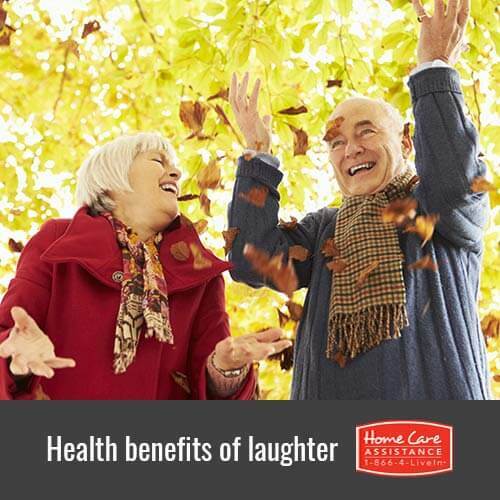 Laughter can help a senior feel flexible and energetic enough to do things he or she hasn’t felt up to in years. One of the biggest concerns for seniors is a weak immune system. While not all seniors have a weak immune system, seniors are more likely to get sick and can take longer to heal compared to younger people. With this in mind, laughter can actually help boost the immune system. The body is less likely to become ill when stress hormones are low, and laughter can stave off these hormones. Laughter has been strongly linked to an increased production in infection-fighting antibodies, thus helping seniors gain more disease resistance. Sometimes aging can be both emotionally and physically draining. Studies show that seniors who regularly take time out to enjoy life and have a nice time – those who laugh more, especially – are more likely to boost their happiness and mental wellbeing and have lower levels of depression. For more information regarding senior health and wellness, reach out to Home Care Assistance. Our caregivers provide as-needed senior home care Orlando families can trust, including personal care assistance, transportation to and from appointments, or even emotional support. Call an experienced Care Manager today at (407) 604-0506 to learn more about our care services and schedule a no-obligation consultation. We look forward to hearing from you.